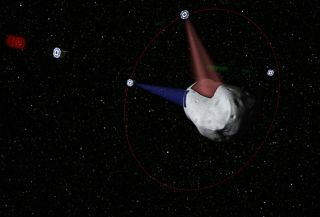 Planetary Resources plans to develop prospector probes, which will determine the composition of asteroids before they are mined. On April 23, a team of entrepreneurs announced a new venture aimed at mining the solar system. The Planetary Resources company, backed by filmmaker James Cameron, Google co-founder Larry Page and others, plans to launch a line of spacecraft to prospect, and eventually extract minerals from, near-Earth asteroids. The ambitious project aims to advance space exploration by mining water from asteroids and selling it to spacecraft for use as fuel as well as for astronaut use. The company also intends to dig up platinum-group metals such as ruthenium, rhodium, palladium, osmium, iridium, and platinum, from asteroids and return them to Earth. These elements are hard to find in space, but come in handy for manufacturing, electronics and other applications. If you've ever wanted to be an asteroid miner, here's your chance. A newly unveiled company with some high-profile backers announced plans to mine near-Earth asteroids for resources such as precious metals and water. Photos and illustrations of Planetary Resources' plan to access the vast resources of space. The prospect of mining asteroids may sound like science fiction, but that's exactly what the ambitious new company Planetary Resources, Inc. plans to do — and a recent study by NASA, university and private groups says it's actually possible. Human dreams of mining asteroids won't become a reality without space robots. The billionaire-backed company Planetary Resources has announced plans to do the dirty, dangerous job of space mining with its new line of robotic spacecraft. Is Asteroid Mining Legal Under Space Law? Does a private company have a right to stake claim to an asteroid, or are celestial bodies such as the moon, planets and asteroids the communal property of all Earthlings? Nobody knows exactly how much asteroid wealth exists, but early estimates point to riches beyond Earth's wildest dreams. If Planetary Resources succeeds, it will breathe life into an idea that is more than a century old and a staple of many science fiction books and movies.